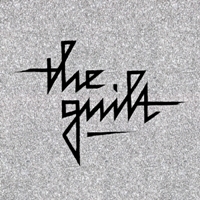 In 2012 lazer punk duo The Guilt made their first appearances. 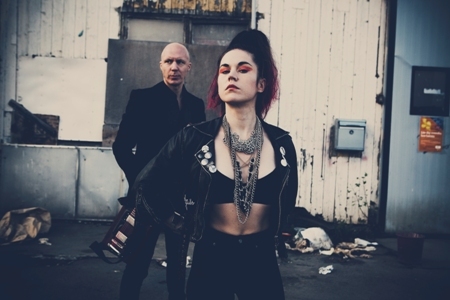 Formed in Helsingborg, Sweden by vocalist Emma and multi-instrumentalist Tobias and born from the tragic death of an old friend, the duo decided to start fresh. Inspired by everything they ever listened to in the nineties. The Guilt became their channel for dispersing frustration through dancing and shredding guitars. Instead of replacing their friend behind the drumkit, the duo played all the synths and drums through an iPod. This was later replaced by a Roland synthesizer and the duo have gone from strength to strength; exploring the dichotomy between the genres, screaming louder and adding glittery gold in everything. Metalnose had a short chat with the duo as its first full cd ‘The Guilt’ is released on Heptown Records. Can you tell how you developed your style and sound? Coming from a background with loud and heavy guitar based grunge, garage and punk, creating a sound as a two-piece wasn’t really obvious. It was a process of “trial and error” trying different synth/machine/drum sounds, guitar sounds and vocals. We had to rethink everything about how to make songs. But we also wanted to play as much and soon as possible, so we did. Playing our songs in interaction with the audience, no matter how unfinished our sound was, gave us clues on who we were as this two piece, and now we sound like this! What made you decide to work in a duo format? We wanted to play where-ever, whenever and with a lot of room for our stage egos. How did you choose the name of the band? Special meaning for you? Guilt is a powerful component and driving force in our culture, in our lives. Also, sounds cool. Who are the artists that have inspired you most in music? PJ Harvey, Nirvana, Frustration, The Kills, Disfear… it’s a long and irrational list. Can you tell something about the writing process of your songs? Hmm.. we guess it’s a about the same for everyone, except that it takes us longer since our drummer has no brain. We start with a riff or a beat or even an idea. Then we end up with something completely different. What inspires you for the lyrics? Well, it’s a kind of communication where you are not in control. Luckily it’s hard to tell the words sometimes because of the screaming. It’s life stuff though, feelings, state of being etc. How were the reactions so far to your album? We are happy to say that most of the reactions are good! Of course it would be cool if someone that really hates it would step forward, I mean we expect there to be some negative reviews out there as well. It would be weird to have done something that fits everyone! I read that you play everywhere were possible, small or big, private or public, what are your experiences so far? Everything is different, everything is cool. It’s not the size of the venue or even the size of the crowd that determines if it’s a great experience or not. You have played in different European countries already, how have you been received? With dancing! Which we love. Of course we’ve had crappy shows with five people too but all in all Europe is good to us. I see you were in Belgium right after the terrorist attack on the airport. How about that? It was out of the ordinary of course. We live sheltered lives so this event (and others like it where you are physically and psychologically close to the center of the storm) connects you with the world in a brutal yet realistic way. What are you ambitions and plans? Marry another duo and take over the world as ABBA 2.0! (laughs) We would like to find a creative space of mind and start working with new tracks for the next release! We want to play more, in new areas, meet funny people and dance a lot. 12th-16th of September we will play in Germany, 4th-8th of October – Switzerland!